This statistic shows the leading 20 value retail centres in the United Kingdom (UK) in 2014, ranked by value stores as a percentage of all stores. Barnsley ranked the highest, with 26.6 percent of all its stores being classed as value retail. Everything On "Discount stores in the UK" in One Document: Edited and Divided into Handy Chapters. Including Detailed References. 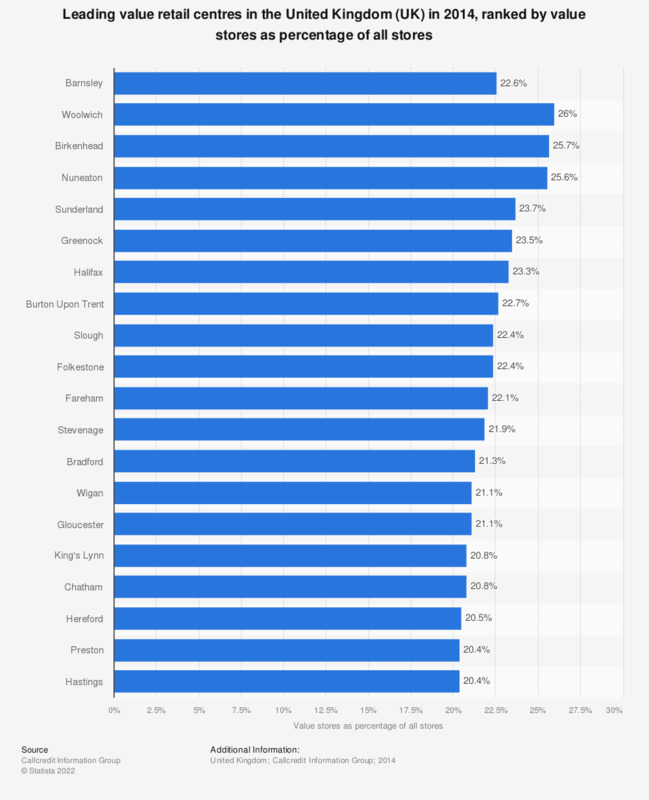 Statistics on "Discount stores in the UK"
Which of these stores would you consider to be a 'discounter'? Percentage of shoppers who agree with the statement: "I don't like the environment in discount stores and would rather shop somewhere more pleasant even if the prices are higher"
Percentage of shoppers who agree with the statement: "I would rather people didn't see me shopping in discounters"
How have your impressions of discount retailers (e.g. Aldi, Lidl, Iceland) changed in the last year since the 'horsemeat scandal'?